The ladies win in Buncrana, there are personal bests for Ben and Alison, abd Peter ran Rugby. On Tuesday night a strong showing from the club competed in the 22nd edition of the Maghera 10k and 5k Road Races. The route took runners from the starting point at the Gort Service Station into the countryside before looping back through the town on what was described as an undulating course. First over the line in the 10k for Ballymena Runners was Connor Reid (35:56), Eamon Loughran (37:28) and Linda Petticrew (45:45). Also competing was Alison Foster, who recorded a personal best 47:40, Chris Magill and David Nicholson. 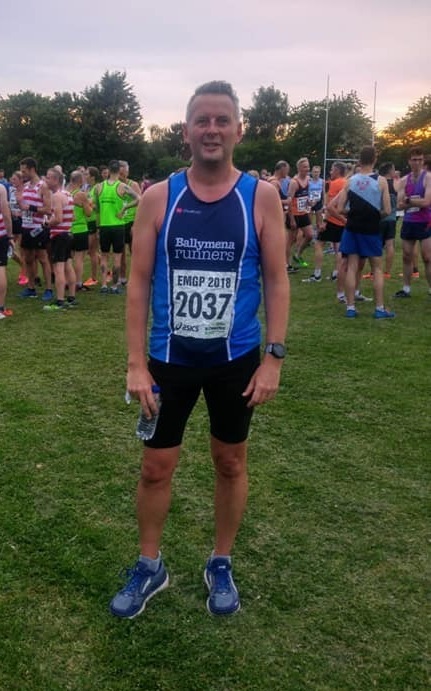 Meanwhile, in the associated 5k, Glenn McGall led the Ballymena charge in 22:29 ahead of Teresa Mark, Helen Beattie and Wendy Moore. In glorious weather eight club members travelled to the coastal town of Buncrana to compete in the ultra fast 5k held on Wednesday evening. Athletes travelled from near and far for the event. Recent Belfast Marathon winner Eric Keoch (Project Africa) led the quality field home in a quick time of 14:35. Mens captain Ben Morrow led the club charge (16th) in 16:14, a personal best, with Michael Bennett (33rd) following closely behind in 16:49. Super master James Turtle (41st) took 2nd in his age category in 17 minutes 03 seconds with Noel Connor (59th) 1st in his age category (17:57). With three to score Ballymena Ladies packed well, with all three girls coming in under 20 minutes, to win the team event ... Kerry Bamber (18:15), Paula Worthington (18:50 - and 1st in her age group) and Geraldine Quigley (19:32). John Donnelly (20:03) also ran well. Congratulations to all who took part and thanks also to the support crew who made the trip to support our runners. Congratulations to Peter Fleming who competed in the Rugby 6 on Wednesday night. The race, part of the East Midlands Grand Prix, was, as the name suggests, a six-miler on an undulating course starting and finishing at St. Andrews Rugby Club. Peter was 115th out a field 358-strong field, recording a time of 42:03.